Any road trip through the rugged Australian outback will be packed with sweeping red desert and wild native flora to soak in from the car window. The journey from Perth to Darwin via Brand Highway is no different and offers the opportunity for a selection of unrivaled side trips that will open any traveler’s eyes. Highway 1 is a network of roads that run all the way around Australia’s coastline. For the particular route between Perth, the capital of Western Australia, and Darwin, the capital of the Northern Territory, travelers will need to begin their journey on the road known as Brand Highway. Starting off from the Perth city, you will make your way to the coastal city of Geraldton. Simply head north along Brand Highway. The scenic views as you travel along the coast-straddling highways will cause most people to stop for photographs. Once you arrive in Geraldton, the next destination to head for is Carnarvon, another coastal town which resides at the mouth of Gascoyne River. After Geraldton, the Brand Highway becomes the North-West Coastal Highway. To prevent driver’s fatigue, it’s always a good idea to stop in as many towns as you feel you need to. Carnarvon is equipped with dining options, recreational facilities such as parks and reserves, which are perfect for leg-stretching, and accommodation. Upon leaving Carnarvon, you need to head south to re-enter the North-West Coastal Highway. Once you’ve safely joined the highway, head towards the large town of Port Headland. This will be in a northeastern direction. From here, take the Great Northern Highway to the major coastal city of Broome. After passing through Broome, you can continue to take the Great Northern Highway through the Kimberly region, which is one of the nine regions in Western Australia. This area will no doubt offer majestic vistas as you pass the Purnululu National Park to the town of Kununurra, which sits close to the border between the Northern Territory and Western Australia. From this point, the highway becomes the Victoria Highway. Head in an easterly and then northeasterly direction until you cross the border. All you need to do from here is travel towards the town of Katherine, which is approximately 320 kilometers southeast of Darwin. At the town of Katherine, Highway 1 extends in a vertical direction, north and south across Australia. This is known as the Stuart Highway, which you must take north until you reach your destination, the city of Darwin. 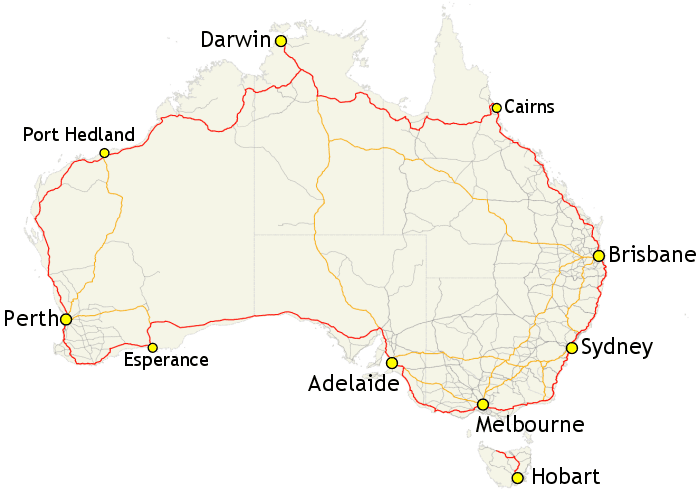 There are several side trips which travelers may embark on during their journey from Perth to Darwin. During the initial leg of the trip, between the Western Australian towns of Geraldton and Carnarvon, many drivers take the opportunity to see the tourist destination known as Monkey Mia. Here, bottlenose dolphins and small sharks are fed and friendly enough to frolic with in the bay. After you pass Carnarvon, you can head to Coral Bay and Exmouth from the small locality of Minilya. From here, you’ll have access to the famed and stunning Ningaloo Reef, where you’ll get the opportunity to swim with whale sharks and manta rays. Once you arrive in the Northern Territory, you could take some time out to visit the Katherine Gorge, which is made up of 13 gorges in Nitmiluk National Park. Kakadu National Park is also located in the region if you need more time to stretch your legs and immerse yourself in the mesmerizing surroundings.